Trade & Fashion Shows by Name: Apparel & Textile Industry Trade Shows Also, special fashion industry events. The Fashion Trade Show by Name directory is for browsing available events by the trade shows name. If you already now the clothing trade shows name, you can easily find the listing alphabetically. If you do not remember the exhibitions exact title, you can still search the directory and visit the web site for the various trade show events. If you are interested in fashion shows, clothing industry trade shows or textile exhibitions, you have come to the correct place. You can also review clothing industry trades shows by Country and by Category as well. 7th On Sixth was previously a fashion week managed by IMG. See Mercedes-Benz Fashion Week. AccessoriesTheShow Pavilion Venue: Jacob K. Javits Convention Center, New York City, NY The world's longest running juried all-accessory trade event, showcasing immediate fashion accessory resources. Runs concurrently with Moda Manhattan. AccessoriesTheShow Venue: The Venetian Resort Hotel, 3355 Las Vegas Boulevard S Las Vegas, NV The world's largest and longest running juried all-accessory trade event. Showcases fashion accessory resources in over thirty classifications. Runs concurrently with Moda Las Vegas and MRket. Asia Pacific Leather Fair (APLF): For over two decades, Hong Kong-based APLF Ltd has been providing the global leather industry with its most important meeting and trading place. The Asia Pacific Leather Fair is organised by Asia Pacific Leather Fair Ltd, a joint venture between CMP Asia and SIC Group. With APLF Ltd as the catalyst, companies in Europe, the Americas, Australasia and Asia come together to trade and exchange information at a number of fairs. These include the flagship APLF, which incorporates the annual Raw Materials & Manufacturing event and the bi-annual Fashion & Finished Products shows. Avantex (Europe): Avantex is the first innovation- and networking forum for the entire textile value chain from the research laboratory to the retail outlet. It is a platform for the launching of new products as well as for the presentation of products in the market sector of textiles. BLUEPRINT in Singapore is the fashion trade gateway for East West Exchange in Asia. BLUEPRINT is a key pillar trade event of Asia Fashion Exchange and the sister event of Singapore Fashion Week. Blueprint Group Pte Ltd was set up in 2011 as a joint venture by co-organisers Textile and Fashion Federation of Singapore (TaFf), MP Asia and Mercury Marketing & Communications. Learn more about Blueprint trade show here on Apparel Search. Bread & Butter: the BREAD & BUTTER tradeshow is for selected brands stands for all aspects of Modern Urban Lifestyle, offering unparalleled inspiration, energy & event, brand building & brand caring at the worldwide unique location of the former Airport Berlin-Tempelhof. Bubble New York: Bubble is a twice-yearly focused trade show in a wonderful space in New York where retailers can meet close to 100 exhibitors from clothing to accessories and more. The Exhibitor's list features an American and international mix of brands, either young/upcoming or already established as icons of a new generation of children's products. The collections are showcased in an industrial building reconverted into lofts in Chelsea. It is located at 601 West 26th Street, 14th floor, between 11th & 12th Avenue in the neighborhood of Chelsea in Manhattan, New York. The event represents a true inspirational bubble for the buyers. It is not only a place to buy beautiful lines, but also an opportunity to discover original visual merchandising displays and new ways to mix and match products and styles. CAMEX, the collegiate marketing expo, CAMEX boasts over 1400 wall to wall booths on the tradeshow floor, many of them displaying the latest collegiate apparel, logoed items, softgoods, and accessories. Trade show hosted by National Association of College Stores (NACS). CAMEX is a three-day buying show with two additional days included for educational sessions on topics such as merchandising, e-commerce, loss prevention, consumer research and much more. China International Footwear Fair (CIFF): fair is operated by Hong Kong-based APLF Ltd. They been providing the global leather industry with its most important meeting and trading place. They also manage Asia Pacific Leather Fair which is a joint venture between CMP Asia and SIC Group. China International Hosiery Purchasing Expo: professional hosiery fair. It contributes in trading and communication of the world hosiery industry by building an international platform in Shanghai for this industry. More than 300 companies with hundreds of brands from all around the world will appear at 10,000 square meters at CHPE. 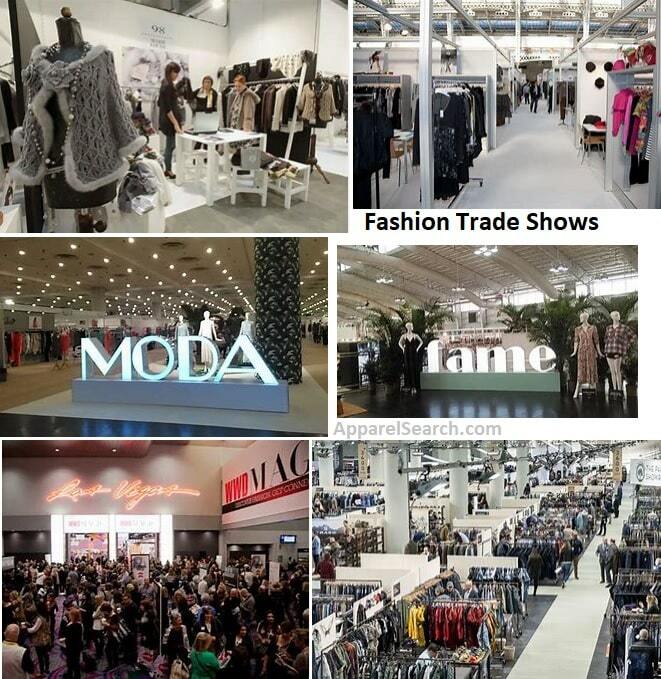 China (Shanghai) International Fashion Production (OEM) Exhibition The fair contributes in trading and communication of the world fashion cloth private label industry by building an international platform in Shanghai for this industry. More than 600 companies with hundreds of brands from all around the world will appear at 100,000 square meters at CTFE. Domestic and international brand men's clothing, women's clothing, the children's clothes, the fashion, knitted dress, the jeans, business wear, easy dress, underwear, leather clothing, silk clothing, all kinds of dress ornaments, a piece of auxiliary materials, the auxiliary materials the underwear, the media of the clothing, the publication, the system integration of IT, clothing CAD. Couromoda (Brazil): Couromoda - International Shoes, Sportsgoods and Leathergoods Fair is the most important and traditional Latin-American footwear show. Taking place in Sao Paulo, Brazil, Couromoda features 800 exhibiting companies and offers 55.000 sqm of total exhibiting space at Anhembi Exhibition Center. The fair presents the Brazilian Autumn-Winter collections and defines the season fashion trends for shoes, sportsgoods, leathergoods, as well as garments and accessories. As the most important footwear meeting in Brazil, Couromoda is acknowledged as the best opportunity to make business contacts and discuss market trends in the Brazilian footwear and leather goods industry. Dallas Apparel & Accessories Market / Dallas Super Market Center: Dallas Market Center, the largest wholesale merchandise resource in the world as recorded by the Guinness Book of World Records, is the one location where retailers from around the globe source a wide range of products ranging from home furnishings, gifts, decorative accessories, lighting, garden accessories and gourmet items to textiles, fashion accessories and women's, men's, children's and western apparel. With more than 50 markets each year attended by more than 200,000 buyers, Dallas Market Center offers an array of services geared toward helping retailers expand business & increase profits. From classic looks to contemporary edge, the Dallas Apparel & Accessories Market showcases more apparel and accessories in more categories each January, March, June, August and October. In addition to the permanent showrooms inside FashionCenterDallas®, buyers will discover a wide range of temporary exhibitors in SCENE, the juried temporary show on the 13th floor of the World Trade Center, in the Strut shoe show on 13, and in Temps on 12 featuring young contemporary, women's apparel, accessories and Western styles. The Denver International Western and English Apparel and Equipment Market is sponsored by WESA -- the Western and English Sales Association. The Market is an international event and the equestrian industry's largest trade show in the world with products for the Western and English lifestyle featuring the largest runway fashion show outside of New York and Paris. Diecutting Symposium - North America: The Die Cutting Symposium program is a two day technical meeting with 18 seminar sessions on topics of interest in many areas of die cutting, die making plus embossing and foil stamping. Delegates also have the opportunity to visit the Industry Resource Hall where almost 100 vendor companies will be presenting information on their products for die cutters, die makers, embossers and hot foil stampers. Learn more about ENK here on the Apparel Search directory. Expofil (France): is a specialised exhibition focusing exclusively on yarns and textile fibres. In these two areas, it is now the leading event of its kind in the world. At each edition it attracts some 160 international spinners, throwsters/texturisers showing products of high added value, and around forty fibre producers from some of the most prestigious groups in the world. The show also includes a selected range of services relating to these sectors: fashion services and consultancy, textile finishing, etc. Ezgi Ajans (Turkey) Diversified service providing company, active in publication, trade show organization, tourism and business representation. Organizers of fairs for the leather fashion industry. With the participation and the visits of the leading companies International Leather Days is a meeting point that includes all kinds of leather products and sub-industry such as leather, leather garments, leather shoes, leathergoods, leather accessories, leather chemicals and leather machinery. Fashion Market of San Francisco: The Golden Gate Apparel Association is proud to present five trade shows each year for wholesale, catalog, and retail buyers of women's clothing and accessories. A grand display of contemporary fashions adorn the Concourse Exhibition Center five distinctive times a year featuring dress and maternity clothing, jr. sportswear, missy, kids wear, sleepwear, intimate lingerie and quality women's apparel of all kinds. Complimenting the mix you will also find a wide selection of fashion jewelry accessories including bracelets, necklaces, pendants, earrings, and other costume jewelry. In addition to jewelry discover unique and custom hats, handbags, belts, sandals, blouses, skirts, pants, jackets, sweaters, and more. Their exhibitors include small manufacturers, factory representatives and sales reps for a variety of women's clothing accessory producers. Their generous four day exposition allows you to spend as much time as you need to secure fine quality apparel for your retail clothing store, wholesale distribution, or catalog house. FESPA: FESPA is an organisation, but also gives its name to events, for example, The FESPA Exhibition and FESPA Seminars. Formerly the name FESPA stood for 'The Federation of European Screen Printers Associations'. Now with the advent of Digital Technology, FESPA is known by its acronym which has world-wide recognition. FESPA's objective is promoting Screenprinting and Digital Imaging through each of the 26 separate National Associations in Europe who are its members. Florida Fashion Focus: Florida Fashion Focus . . . an upscale, open-booth trade show offering the latest trends in ladies apparel and accessories. Florida Fashion Focus brings wholesalers and retailers together in a professional environment designed to provide the optimal buying experience. They invite you to join them at the Sheraton Miami Mart Hotel & Convention Center in sunny Miami, where tropical paradise meets global marketplace! You will find the perfect opportunity to combine business and pleasure in one complete environment! We have created special profile pages for some of the fashion events and fashion industry exhibitions that we feel needed more space than what we could provide below on this page. If you are interested in reading more about clothing and fashion industry trade shows, you can visit our Trade Show Profile section. Return to the top of this Trade Show By Name page.